I came to Santa Cruz quite a few years ago as a braless young vegetarian idealist in search of good veggie camaraderie and foods, among other things. At the time, there were so many vegetarians here that none of the natural food stores carried meats as they all do now. I moved into a cooperative vegetarian household with the agreement that I would cook for the household once per week. I’ve always been an experimental cook, but because I was cooking for others and experiments can go very wrong, I started to consult cookbooks. One of the first recipes I found was Potato Leek Soup. Although this is my own recipe, and my original source is long forgotten, I do remember and continue to use that source’s secret ingredient for a unique taste: a pinch of nutmeg. 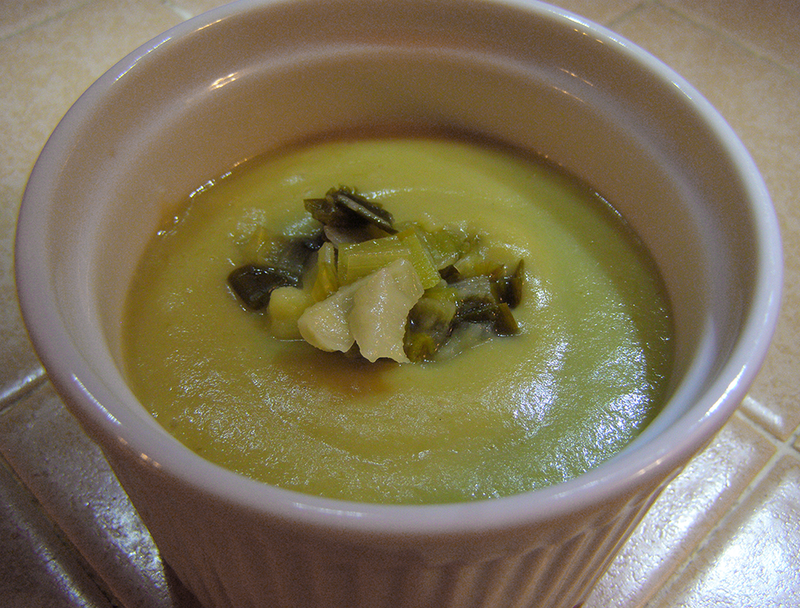 If anyone knows of an old school vegetarian cookbook (c. Moosewood era) that calls for nutmeg in Potato Leek Soup, please add a comment to give credit where credit is due. Saute leeks in olive oil on medium high heat, stirring constantly, until coated with oil and reduced in volume, about 3 – 4 minutes. Add potatoes and broth. Bring to boil. Reduce heat to medium. Cook till potatoes are tender, about 20 minutes. Reserve about 2 tbsp. cooked leeks for garnish, mostly green parts if possible. Warm half-and-half in microwave at 10-second intervals until very warm (about 30 – 40 seconds total in my microwave). Add half-and-half and nutmeg to soup, and season with salt to taste. (Depending on saltiness of broth, extra salt might not be necessary). Puree in blender till smooth. Or, if you’re lucky enough to have an immersion blender , try pureeing right in the soup pot. Pour into four bowls and garnish with reserved leeks and a light grinding of black pepper if desired. Variations: I believe that the classic potato leek soup has a completely smooth consistency, and this is how I usually prepare it. However, you can experiment with different degrees of pureed-ness to see which you prefer. Also, I use a lot of the green leek parts, resulting in a greener leek soup than many.